Our IVF specialists, scientists, doctors, embryologists, Nurse co ordinators and technicians are experts in their respective fields. They’re the reason for the research track record that doubled pregnancy rates in our centre. Department of Reproductive Medicine and IVF science is lead by Dr.Nirmala sadasivam, who is a pioneer in test tube baby treatment since 1995, achieving various mile stones in this field in the past 17 years. She has done research (PhD) in an incredible IVF technique called BLASTOCYST CULTURE – achieving the first blastocyst baby of Tamil Nadu in 2001 in Erode. On 23.2.2004 an elder woman, 64 years old with the husband of 74 years old had an opportunity of having a Male Baby through BLASTOCYST CULTURE in our institution which was the world record then, and the news occupies a page in BBC website even today. GFRC has seen more than 4000 Blastocyst babies by now, leading in IVF service with world class quality. BBC News : A 64-Year-Old Woman and 74-Year-Old Husband Given Birth To A Male Child by BLASTOCYST CULTURE at Genesis Fertility Research Center – Maruthi Medical Centre and Hospitals On 23-02-2004, Becoming The Oldest Motherhood Of The UNIVERSE. Our Laparoscopy team consists of world renowned surgeons who have done more than 10,000 cases of Hysterolaparoscopies. The team head Dr.B.Ramesh is a pioneer in this field having experience of almost 25 years. 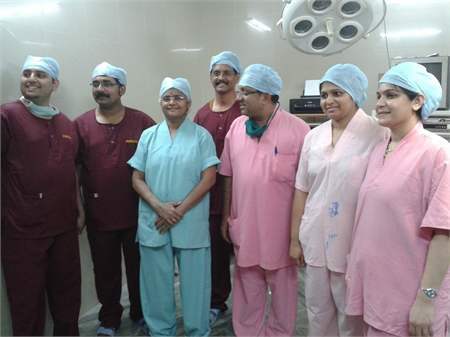 He had reached a mile stone in achieving 52 cases of Hystero Laparoscopies in a single day, in our centre. We employ the best people, dedicated to offer the couples the best chance of completing their family. At GFRC the Fertility Experts will always attend to couples personally at each stage of treatment. Nurse co-ordinator and the counsellor will also be available for the couples for better service. Couples can also meet the scientists who will be working with their embryos to assure the best personalised care and support. Specialised counselling services are also available to them throughout their treatment. We, not only have access to the latest technologies – we pioneer them.